We've really heard enough about start-ups making custom suits for men. Acustom Apparel, Trumaker, Alton Lane, Black Label, Indochino, Arden Reed, J. Hilburn are all making them. For the most part, the category of custom has been relegated to this particular use case. Check out these awesome start-ups working on customized products for women, from custom-fit bathing suits to custom designed jewelry! Bow & Drape Custom Sparkle Sweatshirts. For High-Quality Jeans from your Body Scan, Book an Appointment with Clinton-Park SF. You can read about my Custom Jeans experience here! On Unmade's website, you can manipulate sweater and scarf designs to create your own unique piece. XSwimwear by Sarah Krasley is a Body Positive brand that offers custom fitting bathing suits for women! Design your own Shoes at Shoes of Prey. You can also find their shops in some Nordstrom's locations. Anna Van Mills Luxury Footwear. Anna Van Mills offers a high quality product with aesthetic boundaries. Solely Original is similar to Shoes of Prey, however to do offer a Bespoke fitting service that is unique to their brand. Alive Shoes offers customization for casual shoes, sneakers, and heels. Gilded Lab is a London-based start-up democratizing the bespoke jewellery market. You can create your own designs using their online configurator. Write your own custom message to a loved one. Prescription Glasses and Sunglasses by Sculpt Labs. They take a short video of your head on their iOS app. It then computes into 3D anthropometry and builds glasses to fit your face perfectly. You'll have to wait for these! If you're in SF, you can book an appointment with them, but the company isn't quite launched yet. Spoonflower Design your own Digital Prints. When Spoonflower was first becoming popular, I was still in design school. Getting custom printed fabrics would take weeks. In order to make custom printed garments, a lot of planning was required to make deadlines. Now, digital printing is becoming a more and more ubiquitous printing process. It's waterless and more sustainable than other processes. Designing for digital prints also means that you have an unlimited amount of colors you can use in a single print. Not mention, in the earlier days of digital printing, it was required that synthetic fabrics were used. Over time, the industry has developed its capabilities in printing on natural fibers as well. Read more about digital printing textiles here. Wovns Design your own woven Jacquard. Wovns is opening up design possibilities for limited edition, small run, and designer goods. 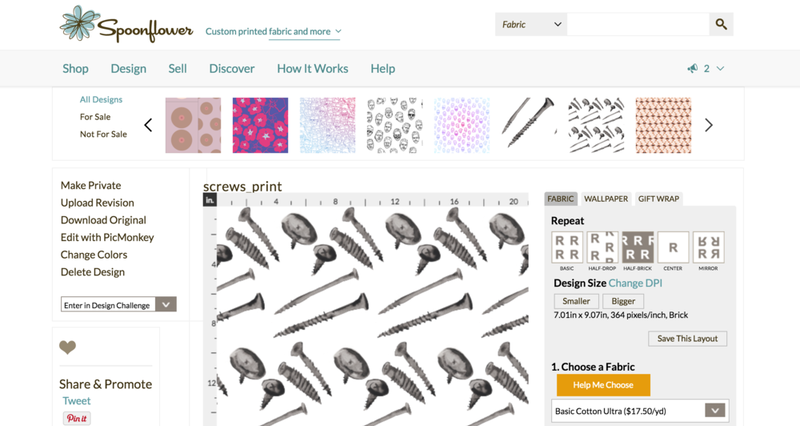 The difference between Wovns and a company like Spoonflower is that the patterns are woven into the structure of the fabric using the Jacquard weaving process. Read more about the process on their Kickstarter campaign. Designing products on your own takes courage! Here are some of my own personal experiments with these platforms!